The Po Delta has been formed over millennia by the sediments deposited by our largest river and redistributed by the action of the sea and the wind. Over time, men have acquired an increasingly important role in the evolution of the Delta and they became the protagonists when, four centuries ago, they performed Porto Viro cut-off, from which the Modern Delta originated. Today their task is to revive the history and nature of this territory, becoming its guardians. Since ancient times, many geographers and mythology researchers have identified the river Po with the legendary Eridanos, the river that the goddess Thetys gave birth to for his spouse Oceanus. According to the myth, along its banks Heracles asked to the nymphs the way to get to the Garden of the Hesperides, where trees giving golden fruits grew. The Argonauts sailed up the river during their dangerous return journey after stealing the Golden Fleece. However, the most beautiful and known tale is about the tragic race across the sky vault by the unlucky Phaethon, Helio's son. While he was driving his father's chariot, because of his recklessness and inexperience, he abandoned the traditional route. He dipped so close that the forests burned and the rivers dried; then he veered too high risking to set the sky on fire. The Milk Way was already burning. 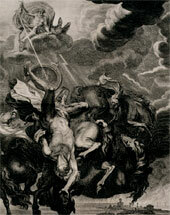 In order to prevent more serious disasters, Zeus stroke the chariot with a lightning bolt and the imprudent charioteer plunged into the river Eridanos where his sisters the Heliades grieved so much that the Gods, moved to pity, turned them into poplar trees that weep golden amber. Leader+ Community Initiative Measure 2.1 Action 2.1a) "Interterritorial Cooperation"
Project: "Historical-Cultural Heritage Enhancement and Tourist Promotion of the Po Delta Territory"
Action A: Po Delta "Heritage Promotion"